Don't look now, but we're all living inside The Running Man. The Running Man is the other great mid-1980s SF-action satire. Whilst the original Robocop is still fondly remembered for its dryly satirical take on the creeping militarisation of the police force, The Running Man is rather overlooked these days - which is a shame, because as others have noted it’s suddenly become extraordinarily timely. 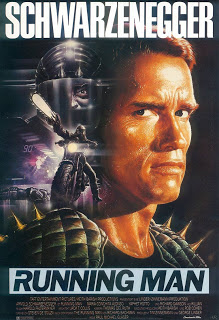 Ben Richards (Arnold Schwarzenegger) is a helicopter pilot for the militarised police of the era; on observing a food riot in progress, his superiors order him to open fire on the unarmed protesters, but he refuses. After his colleagues overpower him, the attack proceeds - and to add insult to injury, Richards is not only brought up on insubordination charges, but is actually blamed for the massacre, his resistance serving only to set himself up as a suitable scapegoat. After escaping from jail, his story comes to the attention of Damon Killian (Richard Dawson), who is both the host and the production mastermind behind The Running Man; whilst as a matter of policy military prisoners are not used as contestants on The Running Man, as Killian points out Richards is, by virtue of escaping, no longer a prisoner. A few phone calls to the White House to smooth things over later, and once Richards is captured again he ends up forcibly drafted into the show and about to shake hands with danger. However, in the meantime he kidnapped Amber Mendez (Maria Conchita Alonso), a jingle composer for the TV network, in a doomed attempt to use her travel credentials to escape to Hawaii. Whilst Mendez at first was happy to believe him to be the brute the propaganda and his own behaviour made him out to be, she realises that the news reports of Richards’ recapture blatantly don’t match the facts, and once she pokes around in the network’s news archives she ends up discovering the truth. Shanghaied into the show herself, can she, Richards, and his buddies from the resistance that helped him escape jail in the first place beat the stalkers at their own game and get the truth out? Of course, any rotten regime in a political dystopia is conveyed much better if you can present a character who can act as its face, and The Running Man excels thanks to Richard Dawson’s absolutely perfect casting and excellent performance as Killian. Dawson had been the host of Family Feud for about a decade previous to this, and had only just stepped down from the role; here, he clearly relishes the opportunity to offer a vicious, snarling, malevolent version of the family-friendly style he’d adopted for that show. Killian’s dual role as presenter and producer also reads like another sly nod to the world of pro wrestling, since at the time Vince McMahon presented himself on TV merely as a member of the WWE commentary team, when in fact he was the boss of the company and had final say on all the booking decisions, much as Killian has the final say on the show here. There’s also an undercurrent of music censorship as a bellweather for political authoritarianism - a then-current issue considering the PMRC hearings at the time. Amber’s character has a stash of cassette tapes on the censored list, and on a more meta level the leaders of the resistance are played by musicians - Mick Fleetwood appears as Mic, the overall leader, and his second-in-command Stevie is played by Dweezil Zappa, whose dad Frank had memorably savaged the PMRC when he appeared in Congressional hearings on the matter. As an entry in the 1980s sci-fi dystopia subgenre, The Running Man shows a decent awareness of other entries in the field. One of the high-security areas in the network headquarters is marked “Information Retrieval” on the front door, which I like to think is a nod to Brazil. Whilst it only came out a few months after Robocop, it does share with it a fine knack for including snippets of the tasteless television of the age - like the hilariously crude Climbing For Dollars - which illuminate the setting more in the few sections they appear onscreen than a fifteen-minute worldbuilding lecture could. It isn’t perfect, mind; there’s kind of an alarming start to Ben’s interactions with Amber, his eventual love interest, his invasion of her home panning out in about as violent and creepy a way as it could without him actually hitting her or sexually assaulting her, to an extent that Ben’s desperation to stay ahead of the authorities can’t quite account for. I think at this stage in the thing Ben is meant to be a mercenary out-for-himself sort whose disillusionment with the system has made him cynical and unable to believe in the possibility of making a positive change, with him only coming around to the Resistance’s point of view later on, but they overplay their hand there, making Richards seem outright unlikeable for the space of those scenes. The Running Man has been rather badly-served in the home media stakes - for a long time the only DVD copy of it I could find was a horrible version which didn't even have anamorphic widescreen, and I've only recently been able to upgrade it to a Blu-Ray by importing a German version. It remains to be seen whether this changes. Over time, the movie has gone from being a recognisable caricature of the era it was made in to feeling somewhat out of touch and absurd to being weirdly timely again. There’s even a sequence in which they use digital methods to make it look like Richards and Captain Freedom have had a terminal duel which Richard loses, even though their likenesses were just digitally presented on stunt actors - just like Leia and Tarkin in Rogue One. With Schwarzenegger firing off salvos at Trump on Twitter, one can only hope that our own 2017 dystopia ends half as well.